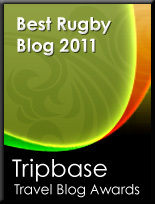 TOTAL FLANKER...a rugby blog: Edinburgh on old fart alert! 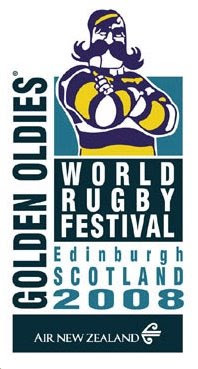 Good luck and best wishes to all those geriatric rugby players descending on Edinburgh this weekend for the 17th World Golden Oldies Rugby Festival which runs from 1st-8th September. Teams literally from all over the world will be taking part - players from Argentina, Australia, Bahamas, Canada, Cook Islands, England, France, Germany, Ireland, Italy, Japan, New Zealand, Russia, Samoa, Scotland, Spain and the USA will be coming together to play to their own peculiar laws (not an ELV in sight I'd wager) and to enjoy Edinburgh's famed hospitality. My particular best wishes go out to the Cancer Research UK Crusaders who, recognising that I am somewhat long in the tooth, very kindly invited me to join them for the event. Sadly, owing to work commitments, I had to decline but I'll certainly be with them in spirit of not in body. The Edinburgh-based Crusaders are the brainchild of 47-year-old John Munro, who lost his wife Debbie to bowel cancer in 2005. He gave up rugby to care for his sick wife when the illness intensified and lost contact with a sport he had spent his life playing but her death gave him the determination to raise awareness and cash for Cancer Research UK. "When Debbie died from cancer my friends and my rugby team were a tremendous support. It's amazing what the rugby community is like at times like those, I was getting messages of support from around the world," he says. "I thought about it, and in April this year began sending a few e-mails out and it grew from there. Now we have a pool of around 50 players from all over." The Crusaders have been given kilts with their own registered tartan to wear at events, along with specially-designed pink scrum hats to promote the cancer cause, so should be relatively easy to recognise next week. If any of the participants in this event are reading this, please feel free to send me progress reports, stories or pictures from the week's festivities and I'd be happy to post them here. Bon chance one and all! Love your blog! Should be even higher on that list! But that's a different post entirely! Btw... Flanker! I'd appreciate it if you'd let this post slide through (some shameless punting of our tournament might follow), but it would be great to get some of you Mud Island blokes over here in Pieter De Villiers land. So, as the old farts descend upon Edinburgh I urge the younger lads to take a look at that Social Rugby World Championship tournament in South Africa next year - which coincides with the Lions tour. One of these days, I would love to get to one of these old boys tournaments. Quite a few of my Metropolis mates will be going to Aspen, Colorado in a couple of weeks. Alas, I won't be part of that group between lack of money and no more vacation time left...someday. Edinburgh would be a great place for a tournament. I went there many, many years ago after just getting out of High school, and I have to say it is one of my favorite cities in Europe. Thanks so much for the comments, the Festival was fabulous and "The Crusaders" made hundreds of new and lasting friendships, we were featured in 11 newspaper articles, appeared twice on BBC Radio Scotland and due now to appear in Rugby World News. The fellow ruggers we met who have been touched in some way from cancer was unfortunately large, many had some extremely postive stories and that is really what it is all about. We are now planning on next years tour, perhaps California or Canada, with Sydney in 2010, get on board become a Crusader.